These are the absolute best, knocking over or trying to recork a bottle of wine has always been painful with most wishing there was an easier or more resourceful way to enjoy a good wine other than out of a bottle. Well now there is, Barokes Wine in a Can, a convenient way for wine drinkers to now enjoy premium Australian wine anywhere. A truly unique Australian product, Barokes award winning range is currently taking the world by storm and is available in 21 countries. Currans Family Wines are a small family owned and operated vineyard in Mildura, Victoria. Currans gapes are grown with well managed watering techniques and micro organism fertilizers, meaning minimal use of chemicals and pesticides. Currans Family Wines produce a top quality Low Sulphur Wine not only for red wine lovers, but also for those who suffer sensitivities and cannot drink it, due to its high Sulphur content. With many preferring healthier alternatives, trying to buy and eat organic vegetables, which is often at higher prices, Eden Seeds allows us to grow our own vegetables with naturally organic and biodynamic grown seeds. In 1987 Queenslander Alf Finch turned his hobby of saving the old traditional open pollinated vegetable varieties into a family business for distribution via mail order. His hope was to make rare and endangered vegetable varieties which were being replaced by new and hybrid varieties, affordable and available. Today Alf and his staff produce an 80-page colour catalogue with 1200 varieties, where seeds are packed and sent to home gardeners, commercial producers and over 300 retailers. 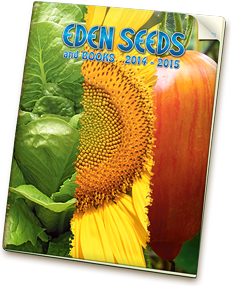 Eden seeds are called open pollinated because they allow natural pollination by wind, bees and insects. Alf says these varieties are hardier, easier to grow tastier and more nutrious.